As June approaches, most of India braces itself to cope with extreme heat, humidity, sweating, and exertion. The problems become worse if you’re someone who suffers from a chronic pain condition, be it back pain, joint pains, or any other sort of pain. Scientific studies have revealed that several pain conditions get aggravated in hot weather. In people who suffer from osteoarthritis or rheumatoid arthritis, the heat and humidity of this weather can lead to swollen joints, leading to an increase in pain. 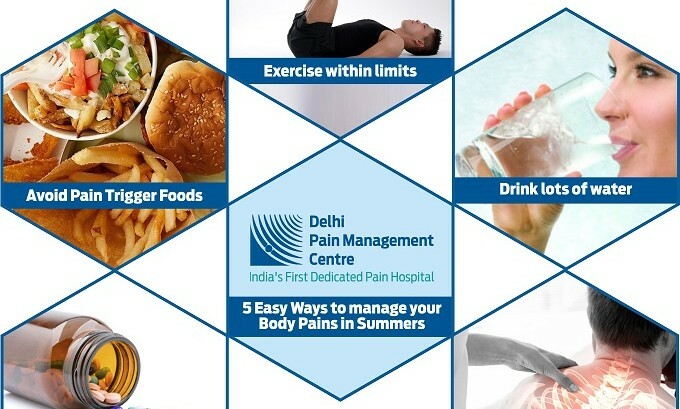 Several other forms of pain are sensitive to humidity and ambient pressure, thus becoming stronger in summers. To add to the problems, excessive sweating can lead to dehydration and mineral imbalance, making pain situations even worse. Drink lots of water – Summer heats remove necessary fluids from the body. To reverse this, it is essential to drink lots of water. It is recommended to drink atleast 3-4 litres of water daily. Additionally, alcohol, coffee, or anything else that promotes dehydration must be avoided. Drinking water not only prevents cramps, and joint pains, but also protects the body from other problems like kidney stones. Exercise within limits – Regular exercise is usually recommended for people suffering from chronic pain. 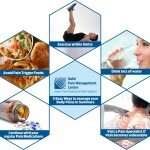 However, it has been observed that in summers, overexertion due to exercise can be a factor contributing towards pain. To prevent this, one must always exercise within their limits. It is advisable to exercise only indoors (in airconditioned spaces) or early in the morning, when it is cooler. Swimming & Choosing the best indoor Bike Workouts can be a good form of exercise that is recommended during summers. Avoid Pain Trigger Foods – Certain foods, like spices, excessive salt, caffeine, cola, are known pain triggers, especially in the case of migraines and neuralgic pains. These triggers become even stronger in summers. It is best to avoid these trigger foods in this season. Continue with your regular Pain Medications – If you’re taking regular medicines prescribed by your Pain Specialist, do continue them throughout the season. Take your doctor’s advise while changing any medicines. Warning: Take regular pain medicines only when prescribed by a Specialist. Often, self-medication on painkillers does more harm than good. Visit a Pain Specialist if Pain becomes unbearable – If pain becomes unbearable despite taking these precautions, you should visit a Specialist Doctor at the earliest to get a definitive diagnosis and start your treatment. Pain is a complicated problem, and when ignored for long, it can worsen very rapidly.